Ugandan soldiers serving with the African Union Mission in Somalia (AMISOM), walk across a bridge near the town of Janaale, Somalia. The United Nations Security Council on Wednesday strongly condemned the terrorist attack on 1 April perpetrated by the Al-Shabaab group against the Ugandan contingent of the African Union mission in Somalia. “The members of the Security Council reaffirmed that terrorism in all its forms and manifestations constitutes one of the most serious threats to international peace and security,” said a statement issued to the press. The Council underlined the need to bring perpetrators, organizers, financiers and sponsors of these reprehensible acts of terrorism to justice. The attack reportedly killed and injured a number of soldiers belonging to the mission, known as AMISOM. The Council underscored its full support to AMISOM in delivering their mandate to reduce the threat posed by the terrorist group Al-Shabaab and armed opposition groups in Somalia, and paid tribute to all international actors working to bring peace and stability in Somalia. 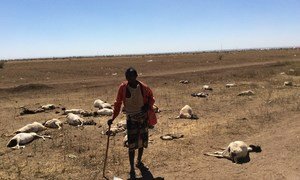 Below-average rains forecast for Somalia could lead to devastating cattle losses and intensify malnutrition in the Horn of Africa nation, the United Nations food security agency has warned.